How do Wireless VR Escape Rooms work? If you haven’t tried a Virtual Reality (VR) escape room, you might be wondering how it all works, and how it differs from a traditional escape room. Wireless VR escape rooms are the new trend in using technology for gaming – and we think you’ll love the unique experience it provides. Hopefully here we can try and explain how it works, and what to expect. A traditional escape room is set in a self-contained room where you can touch and explore objects that have been placed for you to find, you’ll follow clues and prompts and (hopefully!) at the end you’ll escape your room by solving and deciphering logic puzzles. However, a VR escape room is usually quite different. Instead of being confined to a room with props and puzzles, you’ll be transported (using a VR headset) into another world, or location, or dimension. You’ll be immersed in another world, and be presented with a mission, or problem to solve together as a team. It’s an incredible experience because you’re living a different, and virtual, reality. It’s like stepping into a computer game. You become the character, and the experience becomes a reality through your movements and actions. Our Huxley experience involves ‘free roaming’ where players are equipped with the latest in portable mobile VR technology. It means there is no cable or wires (so no tripping up!) and it lets you fully immerse into your VR mission. 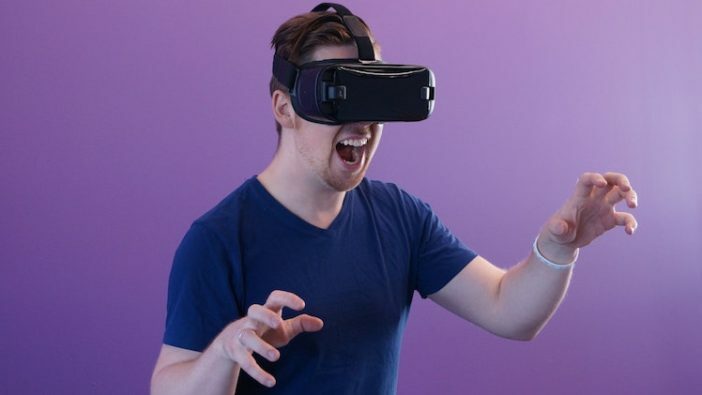 Our Huxley VR experience (located in our Aldgate Omescape) you’ll wear your VR headset, your handsets, and also a backpack (used to power the technology). Because of the narrative of our Huxley experience, the equipment you wear feels like it’s part of the fun and part of the story. Your charging backpack feels like your characters’ exploring gear, and your headset feels like part of the story too. Is VR limited for group size? It depends where you’re experiencing it and what mission or narrative you choose to take part in. Our Huxley experience can be played by groups of between 2 to 8 players. If you have 2-4 players, you will work together in one team. If you have 5-8 players you will play head to head in two teams. If you’d like to know more about Virtual Reality or escape rooms, we’d love to hear from you. It’s a fantastic experience for friends or colleagues looking for a fun and unique activity, and our Huxley VR experience has won multiple industry awards.